MESSAGE FROM THE GM: SEPTEMBER! TICKETS: The Go Goodwin’s Manchester Storm are back in action this Sunday 2nd October with a “War Of The Roses” Challenge Cup match against the Sheffield Steelers. Face off is at 5.30pm and tickets can be ordered online or by calling the box office on 0161 926 8782, or in person at the box office. Firstly, apologies for my lack of updates the past month, it has been super busy getting all the guys across the Atlantic, housed and settled, plus getting the season up and running! So, how’s everyone enjoying the opening games that we’ve seen to kick start this new season? It’s fair to say Pach and I are very happy with the team that’s been put together. Everyone knows the type of team we wanted to build here this season, which was bigger, more physical, fully committed both ends of the ice, and a locker room filled with good people and leadership. We are very content we have that. 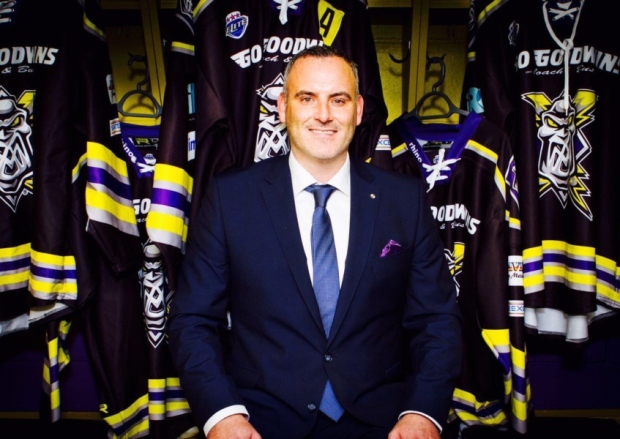 The core group is filled with good individuals who have a real hunger and desire to win, but also to help the Manchester Storm franchise continue to build on the excellent foundations laid in our first season last year. Our opening few home games of the season have been great to watch, beating both Cardiff & Coventry, both Ehrardt Conference sides, were real statements of intent from us. The atmosphere created in the building for those games were great, and trust me, the guys hear every chant which energises them big time. The “We’re The Manchester Storm” chant at the end of games is brilliant, and as I said, the guys love it. Saturday past saw us lose at home for the first time this season, as Braehead skated away with the 2 points. They came in desperate for the victory, especially after us taking the two league points off them the previous Saturday up in Glasgow. Our work rate was there from our side, but we struggled to really get going like we know we can, and Braehead were deserved winners on the night. Sunday night in Edinburgh, i thought we played a really strong game. They’re a vastly improved side on certainly the second half of last season, and made life difficult on occasions for us, but i really feel we bossed large chunks of the game and were it not for Travis Fullerton in the Caps goal who was superb, i think we’d have skated away with both points instead of the one that we secured in the end. Matt Bissonnette unfortunately picked up an injury early in the Saturday game vs Braehead, but after a trip to the hospital, it appears the damage isn’t as severe as initially thought which is music to all of our ears. Even though he was out injured. He is being treated as “day to day” by the medical staff, so at this stage, we are still unsure whether he will play this upcoming weekend. The EIHL is full of good teams this season. There literally are no nights off anymore with every team having dangerous players within their ranks, and the overall quality of the product served up to the paying fan is excellent. Fast, physical and highly skilled players with superb resumes are widespread across the EIHL now, so everyone is getting excellent value for money in terms of the on ice product. In days gone by, there were games you knew that your team was going to win before the puck was even dropped, given the disparity in terms of quality between some sides, but not anymore. Every single night is a battle, and this is something we have drummed into our players, especially the new guys to the league who are used to the regular season being pretty much being all about ensuring you qualify for the play-offs. Here in the UK, the league is the “Daddy”, which means pretty much every weekend has importance placed on it, which again for you the fans who pay your money to come and watch the sport, means that you’re seeing high intensity hockey all season long. Every game means something. This upcoming weekend we travel to Nottingham on Saturday night in a game that doubles up as League & Challenge Cup, before we face old rivals, the Sheffield Steelers at home on Sunday (5.30pm). There’s just always something different about this game. A different energy in the building from you the fans, the players know what it means too. Don’t ask me why, but I have a feeling the home game on Sunday is one not to be missed. The “War Of The Roses” clashes have offered up some high intensity battles, and with the fight we showed in the early season Exhibition and Challenge Cup games against them, I think Sunday is going to be an amazing spectacle, so make sure to get your tickets early and bring along some newbies to the game with you! You know they’ll love it just as much as you do! Just on that subject of newbies; I always love receiving emails etc from new fans who have come to a game and got instantly hooked by the sport! 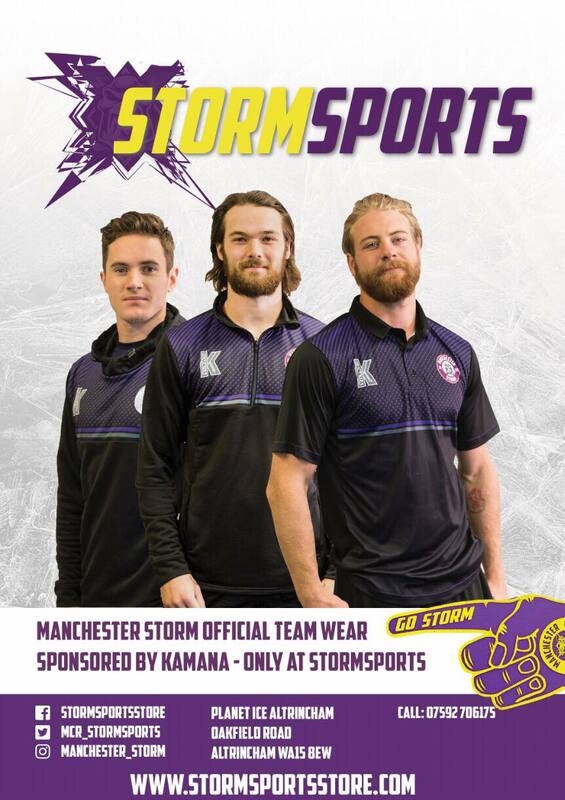 Generating new fans is always important for every club, but it gives me a lot of pleasure seeing it so much with the Storm as we continue to build the club. Our players are already heavily active in the community with school visits in full swing, and to have players being so passionate about doing them is great to see too. This group of guys “get it”, they understand the importance of being good brand ambassadors for our club wherever they go, and they are all more than willing to go above and beyond with community projects. If you have any groups/schools that you’d like the Storm players to come visit, please contact [email protected] and she will sort it all for you. Also, how awesome is the new Storm intro video?! A massive thanks to Keith Jacobsen from Lime Grove Studios for his massive help in putting it all together. Keith has been massively helpful for me recently in helping produce really slick content videos including the individual player entrances & goal celebrations which you can see up on the screens! Eric Neilson’s goal celebration video is something else eh?!?! Also Keith has helped produce the current promotional video which you can all see being spread across Greater Manchester on social media platforms such as Facebook & Instagram. Right, time for me to sign off, I’ll see you all at the Storm Shelter on Sunday (5.30pm Face-Off) for the big clash vs Sheffield. I cannot wait for it, always something different about these games vs Sheffield as i mentioned earlier. The players will be ready for battle, you the fans bring the energy and noise, and let’s take it right too them! Captain TJ previews upcoming weekend!